This year’s 2018 Olympic Winter Games in Pyeongchang went down in history for debuting sports like Snowboarding big air and Alpine skiing team event. But these events were not the only “firsts” that viewers saw. Slovenia’s Olympic Team presented a Messenger chatbot under Foksi (Foxie) persona. Designed and built by the agency team at fbchatbot.si, the bot was unveiled a couple of months prior to Pyeongchang 2018 and landed in the spotlight during the Olympics. The Olympic Committee of Slovenia is one of the “youngest” Olympic Committees in the world but already has a rich history of great Olympic stories. Chatbot Foksi, of course, can tell users all those stories. In addition, using the bot people can find general information about Pyeongchang 2018 and the history of Slovenian Olympic medalists or take an Olympic quiz, browse the merchandise e-shop, and get support. Foksi was the central channel for real-time communications with the Slovenia Olympic Team. 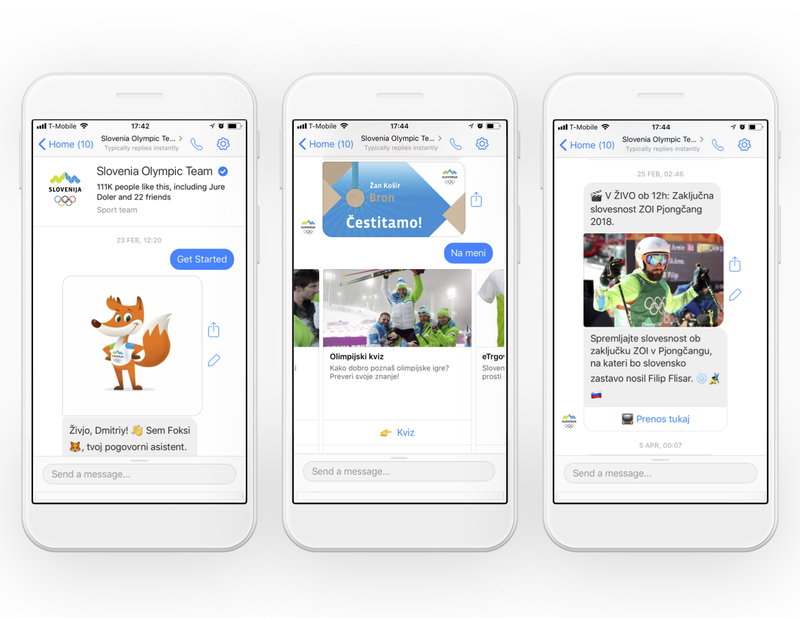 During the Pyeongchang 2018 Winter Olympics, Messenger chatbot was the leading source of information about the Slovenian athletes, game schedules, results and more. More than 3.5K subscribed fans and supporters were the first to find out about the Slovenian medalists, and they received a daily event schedule with a link to past competition rankings. The open rate of the broadcast messages was 93% on average during the 2018 Olympic Games. Foksi captivated users from the very beginning. It was clear that more users were active on the Team Slovenia chatbot than its official iPhone or Android apps. A couple hundred downloads of the official app was small compared to over 6,700 total bot users (over 50% of whom subscribed to receive regular updates). As far as the user acquisition costs go, Team Slovenia ended up acquiring 33 times more users in the bot compared to the app downloads for the same promotion budget. 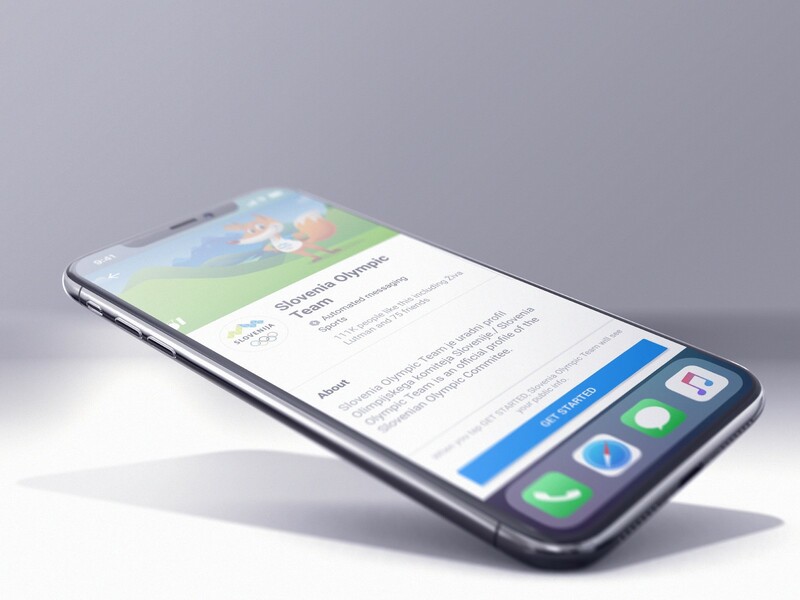 The decision was clear: Team Slovenia dropped its app, making Foksi the #1 source of information for the Slovenian athletes at the 2018 Olympics. Text, Images, & Quick Replies: Olympic Quiz was one of the most popular features of the chatbot. The fun, lighthearted quiz asked 5 trivia questions by using text, images, GIFs and quick replies. Users could access it in two ways: either through the bot menu or by clicking on a Facebook Ad. The quiz was a big part of the strategy for acquiring chatbot users and subscribers. Comment Acquisition: The most efficient, organic technique for user acquisition was offering prizes to users who commented on our Facebook posts. One comment acquisition campaign just before the Olympics brought nearly 1.2K subscribers to Team Slovenia’s chatbot in one week, without spending any money on advertising. Paid advertising: The cost effectiveness of acquiring users in a Messenger bot proved worthy of the team’s efforts, especially in comparison to the mobile app promotion. Ongoing Facebook advertising helped maintain steady growth of approximately 1K users per month. The team also produced chatbot-exclusive content for these users, including interviews and Q&As.